Today Melissa and I went down to Balboa Park to spend a very nice day outside. 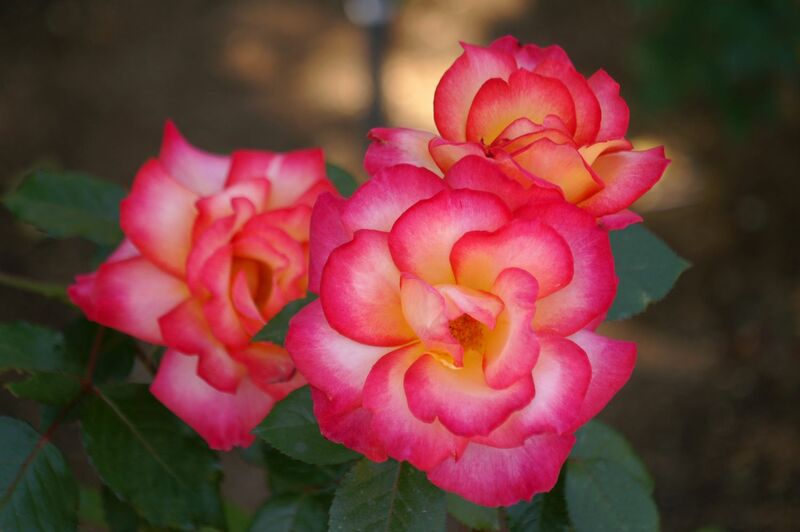 We went to the rose garden, the desert garden, and walked through the museum area. We also walked to an off-park deli (therefore it didn’t cost too much), and had a bit of a picnic under a tree. Mainly I took lots of pictures of the roses. Since I use two popular open-source projects for my website, WordPress for blogging and Gallery2 for image presentation, I’ve always wanted a way to combine the two into a unifed look. It’s always been possible but I never quite managed to do it. Until now, that is. WPG2 is a WordPress plugin to allow Gallery2 to fit ‘inside’ of the WordPress look and feel. I tried their version 1 some time ago, but I didn’t like it because it didn’t work very well. I tried writing my own WordPress-Gallery2 wrapper, but I couldn’t get that to work, either. Now if you click on the My Photo Gallery link, the photo gallery will keep my rocky shoreline header image and the borders that this page has. There are still some CSS-related issues, so when you browse the gallery, the text may be too small to read. It’s too small in Firefox, but not in Safari. I have yet to figure out which browser is wrong. About a month ago I received my iPod settlement gift certificate worth $50. The money was only good at the Apple store. As you can find out for yourself, there’s not much for $50 on the Apple store, save for a few iPod accessories. I didn’t really want any iPod accessories, and besides, most wouldn’t fit my second generation iPod. Of course Apple was hoping that I’d just go ahead and use the $50 as an excuse to by a quad-G5 desktop system for $3,300 (make that $3,250). Look for the one-way streets, wide boulevards, and train tracks. Above the iPod accessories, the lowest price items are software titles. I browsed through them and discovered that there was a Mac OS X version of Sim City 4. I’ve always liked the Sim City series, starting with the orginal Sim City, which you can play online for free. I like the planning of a citys infrastructure. As the ‘mayor’ of the city, the player has to lay roads, freeways, railways, subways, power lines and water pipes. The mayor has to also balance a budget of expedatures and taxes (more on that later). The goal of the game can be as simple as building the largest city possible, or the most asthetically pleasing, or one with the ‘happiest’ residents, or one with the best finances. My goal has usually been to have a high population combined with a happy population. Look for the railroad crossing guards, various species of trees and the accurate railroad “Y”. The newest version has many improvements over the previous versions, Sim City 2000 and Sim City 3000. For one, this version supports regions, whereby you can build dozens of cities that are neighbors on one big map. Each city is independent in that you can only edit one at a time, but cities influence neighbors by way of jobs & trade. One of the biggest improvements has been in the graphics. This new game has beautiful graphics with very high level of detail. There are something like six levels of zoom. The closest one is so close you can see individual ‘sims’ (people) on the streets (look for them on the above image of the train station). One of the keys to a well-functioning city is the transportation system. Sims are very touchy about how long it takes to drive to their job. Sim City 4 introduces a very useful tool that allows you to see what kind of traffic goes where through your transportation system. In the picture linked on the right, you can see all the commute traffic that goes through a train station in the center of town (in the lower-left of the picture). You can trace foot traffic onto a passenger train, which gets off at a different station and walks to a jobsite. I must admit that one key element of Sim City, collecting taxes and balancing a budget, I’ve never really liked. I either cheat to get the cash to run the town, or find some other way to make money, like building a magic building found on the internet. I’m no libertarian – I just don’t really care too much about the fiscal part of the game. If I were really going to play the game for real, I would not cheat. But I don’t want to play it for real, so I feel no guilt. One nice thing about this game is there is no death & violence, no princess to save, and I can stop the game at any time without losing my progress. 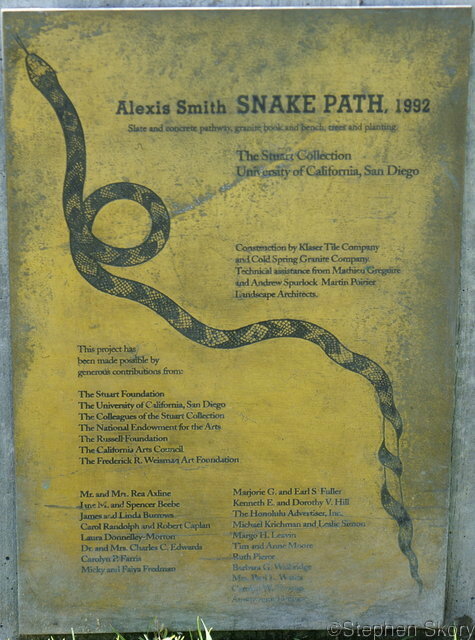 Continuing my Stuart Collection, err, collection, I’ve posted photos of Snake Path (1992) by Alexis Smith (careful with that link, the page loads many large images – it’s very badly designed). 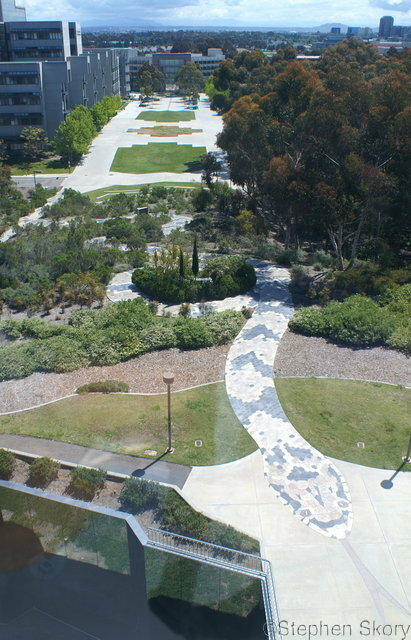 Snake Path is located on a hillside just east of Giesel Library. 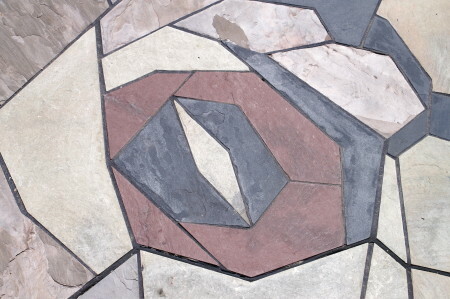 It’s made up of hundreds of shaped pieces of various kinds of stone. The snake loops over itself and inside the loop there is a bench with a quote from Milton’s Paradise Lost. The biblical touches nonwithstanding, I like the path. It begs you to walk its full length like a British garden maze. The path has a definite central crown, like a road, which emphasizes that a real snake is three dimensional. It makes the walk down the hill slighty precarious, making the walk a bit more like an adventure.